You have added Camilla Embroidered Mini Dress in Ivory into shopping cart. The embroidery on this dress is absolutely stunning! The bust and attached skirt of the Camilla Embroidered Mini Dress are fully lined. The spaghetti straps are adjustable and the skirt is made of lightweight flowy rayon. The top of the dress is lightly padded at the bust for support. 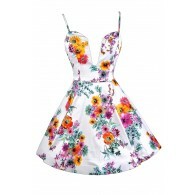 It features an intricate multi-colored flower embroidery pattern that is outlined with a scalloped neckline. The back of the dress has a racerback cut with a sheer netting material. A hidden side zipper completes the dress. We just love all the details of this dress! This dress is perfect to wear on vacation, date night or an outdoor party! You can make this dress boho chic by adding beaded sandals and a sunhat. Or dress it up with pumps and pretty jewelry. Details: Lined at bust and skirt. Adjustable straps. Padded bust. Hidden side zipper. Self: 100% rayon. Contrast: 100% polyester. Lining: 100% rayon. Hand wash cold water separately. Color will bleed. Hang to dry. Small measurements: Length from top of bust: 27”. Bust: 32”. You have added Camilla Embroidered Mini Dress in Ivory into Wishlist. You have added Camilla Embroidered Mini Dress in Ivory for Stock Notification. You have set Camilla Embroidered Mini Dress in Ivory as a loved product. You have removed Camilla Embroidered Mini Dress in Ivory as a loved product.